Blast Cabinets come in suction or pressure models. Featuring original ABS All-In-One construction, Anchor Series is manufactured from 10 and 12 gauge steel for optimized durability. Self-contained units minimize footprint while simplifying installation. Marathon Series, incorporating modular design, can be modified or customized by user. Variety of optional upgrades/add-ons is available. All industrial sandblast cabinets come inÂ 3224, 4228, 3636, 4848, 6048, and 6060 sizes. The Anchor Series sandblast cabinets come in a variety of standard sizes and feature the original ABS "All-In-One" construction. These cabinets are manufactured from 10 & 12 gauge steel, making them some of the most industrial and durable blast cabinets on the market today. The Anchor Series is self-contained and designed to reduce the system's footprint and simplify installation, without sacrificing production capacity. The Marathon Series sandblast cabinets are designed for versatility and performance. These systems incorporate a modular design, allowing customers to easily modify or customize their blast cabinet. The Marathon Series blast cabinets are available in all of the same sizes as the Anchor Series and include a variety of optional upgrades/add-ons to the standard unit. 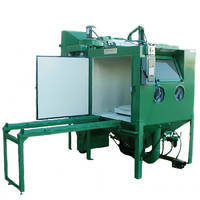 Abrasive Blast Systems' blast cabinets are available in the following sizes: 3224, 4228, 3636, 4836, 4848, 6048, and 6060. More information about ABS sandblast cabinets & all other ABS sandblast equipment can be found on our website at www.abs-airblast.com.